What a blast! 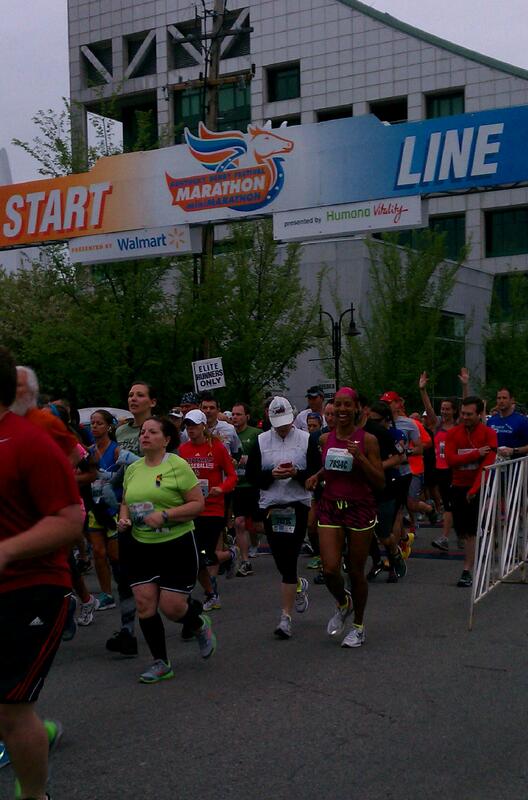 This 40th annual running of the Kentucky Derby Mini Marathon was the best race I’ve ever experienced. The weather was perfect. There was an abundance of support from the community and volunteers. Most importantly, I felt an overwhelming sense of accomplishment. Something about running through the tunnel into the infield area of Churchill Downs warmed my heart. Runners Expo: Attending this expo was like being a kid in a candy store. The Asics tech shirt is top quality. There were a ton of freebies as well as items for sale such as foam rollers for stretching and bling for shoe laces from a place called Bee Cause Charms. I was most interested in a 13.1 bumper sticker and decided to try out a new headband from Hippie Runner. I have some Christian running apparel on my wish list. Running Gear: I bought my outfit almost 2 months ago and over the last week I added details such as the matching neon, wicking socks and neon sports bra. On Friday night, I decided to paint my nails with cute designs to add that touch of femininity which is all too important for a girl raised with 4 brothers. 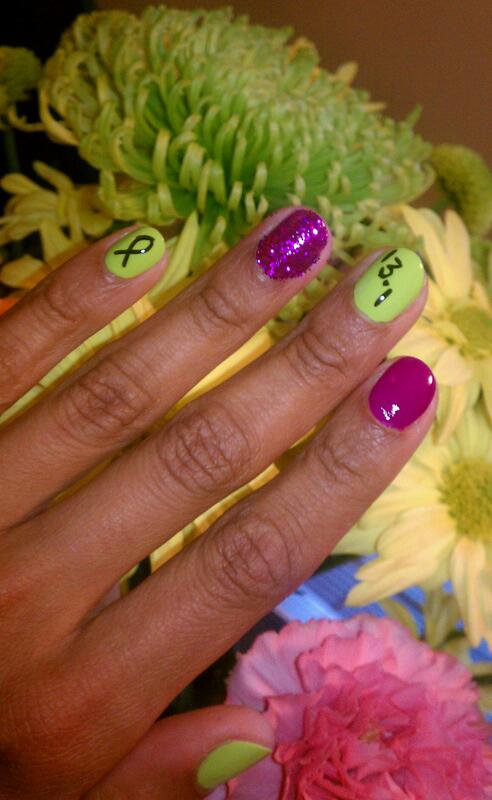 The black ribbon is to remember the tragedy in Boston. 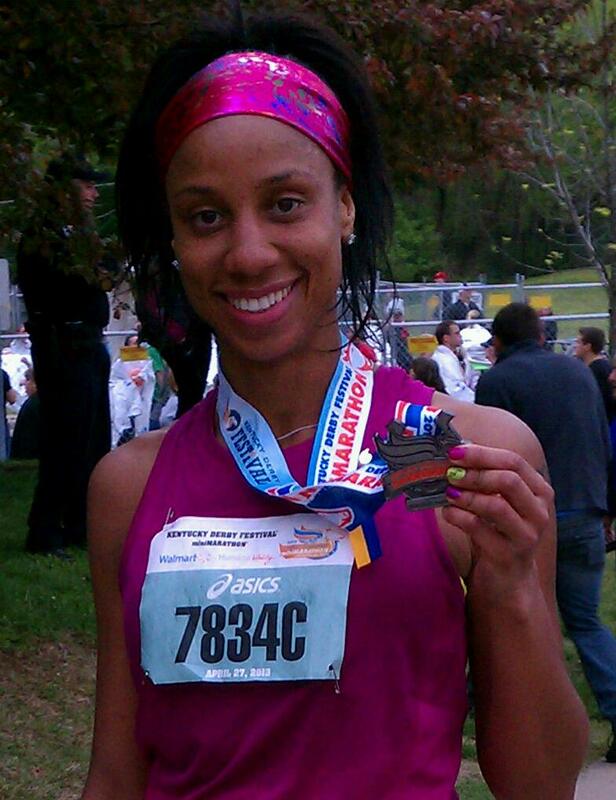 The 13.1 is to commemorate my longest distance to date. Start Line: Some say there were 18, 000 runners and I can believe it. The wave of people to start went on for blocks! Before I made it to Corral C, I met a marathoner and she gave me some great tips about training for distance, compression socks, and how weight training and core exercises have improved her performance. I saw a banner from condo balcony which read “Boston” with a heart. Police presence was deep. 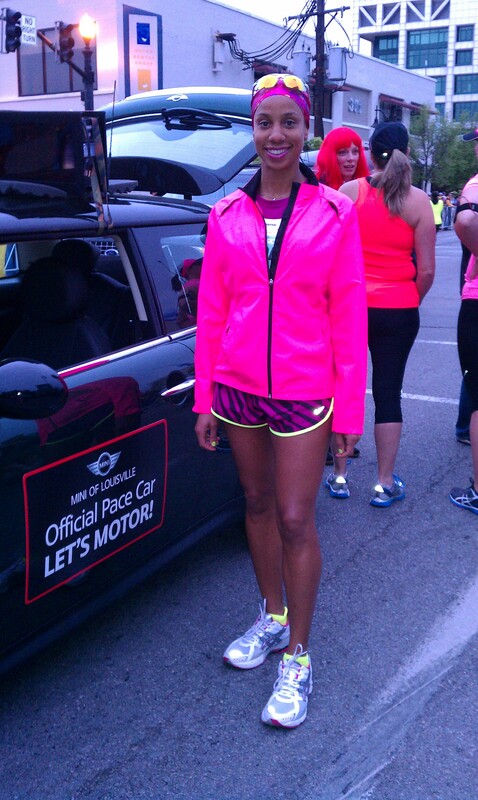 In the midst of everyone rushing to the start line, I paused to take a photo next to the Mini Cooper pace car. After the singing of the National Anthem and a moment of silence for Boston, we took off like true thoroughbreds! Miles 0-3: This part of the race was about easing into a rhythm and falling into a comfortable pace. I started off very slow compared to a 5k race. I spotted a man with a one piece comic character outfit so I hung with him for a couple miles. I passed up a lady who ran the Polar Bear Grand Prix. She recognized me and said “Hey aren’t you the lady who did the cold weather races?” We exchanged words of encouragement and I keep striding. Next up was a set of three Elvis Presley full costumed runners. They had the wigs, shades and gold spray painted running shoes. Behind me I hear a group singing “The Itsy Bitsy Spider went up the water spout.” This was the fun group. Shirts said Lexington and I heard them say the pace was 8:47. I told myself I would roll with them. I stopped at a water stop off Broadway and lost the spandex comic guy. Miles 7-9: I wanted to pull out from my running group but I was afraid to push hard only being half way through. I popped an energy blast gel chew and tried my best to get water to wash it down. Most of the water got tossed onto the ground with the cup. 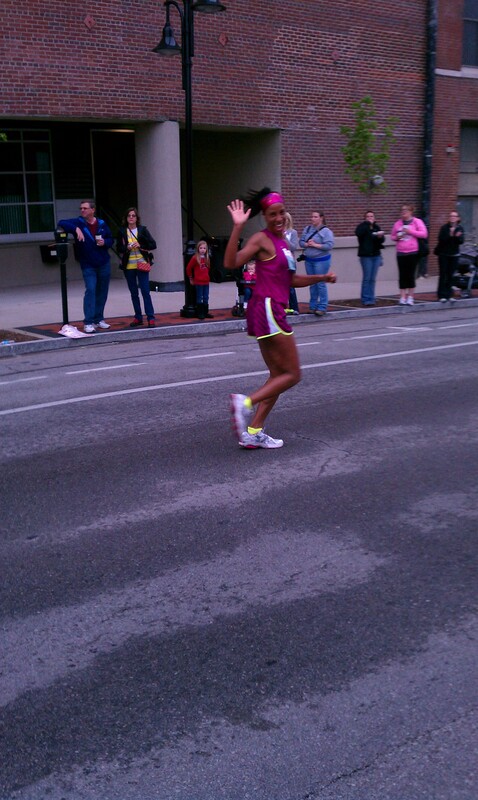 I was focused on my time being under 2:00 so I did not have time to stop and be cute with sipping water. The boisterous Lexington man told me and this other guy named Taylor that we were on target for our 2 hour mark. He told us to push harder at mile 10 and we would be under. He and his lady friend split off to follow the Marathon route. Taylor and I thanked them and cruised on. Miles 10-13 Point Freaking One! : I carried on a light conversation with Taylor. I took a liking to him just because he and my cousin share the same name. We talked about our degrees and professions, both having admiration for each other’s career fields. About 5 minutes later, Taylor told me to finish strong. He was going to drop back in pace. Here I go. No blisters. No pains. I got into a tunnel vision and realized I had to dig deep and complete this race on my own. No pacers, no fancy watch. 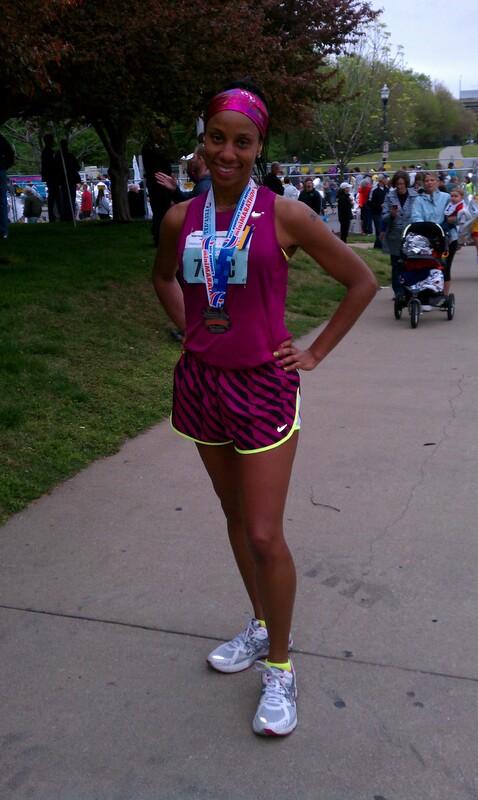 Just these long legs and nice running form to meet my goal. I took that right turn on Main Street and I’m looking for the Finish Line. Out of all things, I get a sinus headache. Last block before I bend that left onto Preston, I see my Foster Daughter’s neon pink skinny jeans. Let me pause for a photo! There is the finish line! 1:55 and some change. Elated! In conclusion, it’s always best to set your next goal when you are at the peak of accomplishing the most recent goal. Mine will be to shave 5 minutes off my mini marathon time and to complete a full Marathon by the end of 2013! Name it! Claim it! Believe it! Receive it! 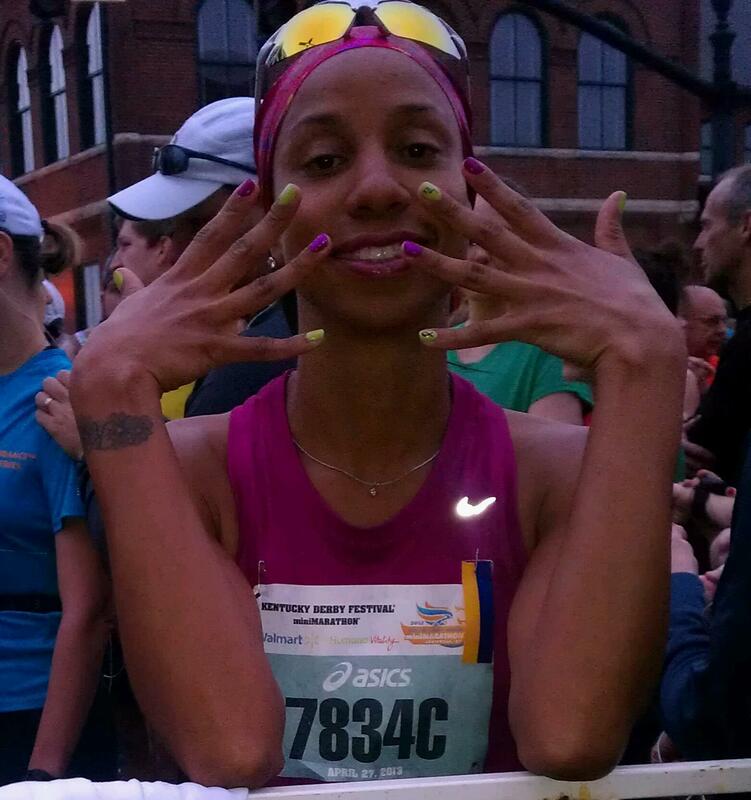 This entry was posted in running, Uncategorized and tagged Finishers Medal, First Mini Marathon, Kentucky Derby, Louisville, Mini Marathon, Running. Bookmark the permalink. Wow…that’s really ambitious! I wanted to build up to the Marathon…so I ran 6 half marathons last year and am doing 26.2 this year feeling that I have adequately trained my body to deal with the longer distance. I’m going to aim for an October or November marathon. I figure it will be easier to train in warmer months versus building on mileage during the winter. I found an awesome international race in Detroit/Canada. I would try 26.2 up there but they have cut off times so they can reopen the Windsor Tunnel and Ambassador Bridge. The Indy Monumental may be an option.